Mary Howard was born March 6, 1809, in Belmont County, Ohio, a daughter of Horton Howard (1770-1833) and his third wife Hannah Hastings (1774-1833). On September 21, 1827, in Franklin County, Ohio, Mary Howard married Harvey D. Little (1803-1833). On October 2, 1828, Mary was disowned by the Alum Creek Monthly Meeting for marrying contrary to discipline. Horton H. Little was born about 1829. Richard Murry Little was born about 1831. Harvey D. Little, Jr., was born about February 1834. Mary’s family was devastated by the Columbus cholera epidemic of 1833. In less than three weeks’ time, she lost her parents, a sister, her husband, and two children to cholera. In the first week of August 1833, five-year-old daughter Caroline Little and four-year-old Horton Little both died. Harvey D. Little, Sr., died on August 22, 1833; he was about 30 years old. Mary was left a 24-year-old widow, with one remaining child and another on the way. In the spring of 1834, Mary lost her remaining two children to scarlet fever. Three-year-old Richard died on April 30, and three-month-old Harvey Jr. died on May 7. Mary had lost her husband and four children within the span of one year, leaving her a childless widow at only 25 years old. On November 1, 1837, in Delaware County, Ohio, Mary married Dr. John G. Affleck (1802-1877), a widower with one daughter. John Gladstone Affleck was born in Scotland in 1802. He immigrated to Virginia in 1820 and studied medicine in Maryland. He was a doctor and newspaper editor in Belmont County, Ohio. John and Mary raised their family in Bridgeport, in Belmont County, not far from where Mary had grown up. John G. Affleck died February 5, 1877, at his home in Bridgeport, Ohio. Afterwards, Mary resided with her daughter Mary Sharp, first in Bridgeport, and later in Buffalo, New York. Mary (Howard) Little Affleck died April 24, 1891, probably in Buffalo. Harriet B. Affleck was born in July 1839 in Belmont County, Ohio. On September 30, 1858, she married Benjamin Clark Patterson (1827-1900). They had two children: John G. Patterson and George Edward Patterson. Harriet (Affleck) Patterson died February 24, 1912, in Belmont County, Ohio. Edward T. Affleck was born August 23, 1843, in Belmont County, Ohio. In the spring of 1864, Edward enlisted as a first lieutenant and adjutant of the 170th Ohio Volunteer Infantry, in the Civil War. He was taken prisoner at Winchester, Virginia, on July 24, 1864, but was eventually paroled in March 1865. [For more on Edward Affleck’s Civil War service, see “A Tale of Two Howards,” especially Part 12, here on my blog.] On May 17, 1871, in Columbus, Ohio, Edward married Laura Walkup. They had four children: Howard Gladstone Affleck, II; Florence Affleck; Rankin Walkup Affleck; and Edward Tullibardine Affleck, Jr. Edward Sr. had several occupations over the years, including railroad clerk, wholesale coal dealer, bank cashier, and vice president of a dairy. Edward T. Affleck, Sr., died January 27, 1911, in Toledo, Ohio, where most of his immediate family lived. Mary F. Affleck was born in April 1849, in Belmont County, Ohio. On June 4, 1874, in Belmont County, Ohio, she married Joseph Frank Sharp (1848-?). They had nine children: Edward Affleck Sharp; Howard Gladstone Sharp; Marshall Forrer Sharp; Sarah Peirce Sharp; Harry L. Sharp; Helen G. Sharp, who married George A. Neubauer; Frank W. Sharp; Herbert M. Sharp; and one unidentified child. The family eventually moved to Buffalo, New York, where Mary probably died, sometime between 1920 and 1930. This biographical sketch was originally written by Lisa P. Rickey in April 2012 for the Forrer-Peirce-Wood Collection (MS-018) finding aid at the Dayton Metro Library, 215 E. Third St., Dayton, Ohio, 45402; phone (937) 496-8654. Additional information about the sketch’s subject can be found in that collection. For more information about the manuscript collection’s contents, please see the original PDF finding aid available in the Local History Room of the Dayton Metro Library, the OhioLINK EAD Repository entry, or the WorldCat record. Howard Genealogical Information, FPW, 36:20. William Turner Coggeshall, The Poets and Poetry of the West: With Biographical and Critical Notices (Columbus, OH: Follett, Foster, & Co., 1860), accessed 12 Mar. 2012, http://books.google.com/books?id=c4ssJ5obTk8C, 116-118; Emerson Venable, Poets of Ohio (Cincinnati: Robert Clark Co., 1909), accessed 12 Mar. 2012, http://books.google.com/books?id=vZ5AAAAAYAAJ, 42-43; Berman and Flannery, America’s Botanico-Medical Movements, 48. Coggeshall, The Poets and Poetry of the West, 116. Coggeshall describes Harvey’s poetry at length and includes four of his poems. At least two of Harvey’s poems can be found in Sarah (Howard) Forrer’s Album of “Original and Selected Pieces” of Poetry and Miscellany, FPW, 5:5. Another example (“The Dead Father”) can be found in The Columbian Star, 14 Aug. 1830, 110. Ebenezer Thomas to Samuel Forrer, 9-20 Aug. 1833 [four letters], FPW, 1:15; Samuel Forrer to Horton Howard, 12 Aug. 1833 [two letters], FPW, 1:13; Ohio State Journal, 10 Aug. 1833, 24 Aug. 1833, 2 Nov. 1833; Woodland Cemetery & Arboretum Interment Database, accessed 26 Oct. 2011, http://www.woodlandcemetery.org. In 1851, the remains of Harvey, Caroline, and Horton Little were moved to Woodland Cemetery in Dayton. Ohio State Journal, 3 May 1834, 10 May 1834; John Howard to Samuel Forrer, 7 May 1834, FPW, 36:8; Woodland Cemetery & Arboretum Interment Database, accessed 26 Oct. 2011, http://www.woodlandcemetery.org. In 1851, the remains of Richard and Harvey Little Jr. were moved to Woodland Cemetery in Dayton. Ohio Marriages, 1800-1958 (database), FamilySearch. Obituary of John G. Affleck, The Intelligencer, 6 Feb. 1877, in Affleck Family: Obituaries, FPW, 36:6; A. T. McKelvey, “Mrs. 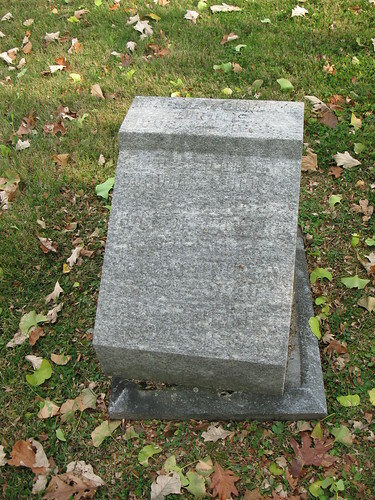 Harriet B. Patterson,” in Centennial History of Belmont County, Ohio, and Representative Citizens (Chicago: Biographical Publishing Co., 1903), accessed 21 July 2011, http://www.ohiogenealogyexpress.com/belmont/belmontco_bios_p.htm. Obituary of John G. Affleck, FPW, 36:6. Mellie Peirce to Howard F. Peirce, 24 Apr. 1891, FPW, 18:21; Mary Affleck to Mary (Forrer) Peirce, 1888-1891 [several letters, all postmarked Buffalo], FPW, 35:5. McKelvey, “Mrs. Harriet B. Patterson”; U.S. Federal Census, 1840-1910; Ohio Deaths,1908-1932, 1938-1944, & 1958-2007 (database), Ancestry Library Edition. Obituary of Howard G. Affleck, in Affleck Family: Obituaries, FPW, 36:6; American Civil War Soldiers (database), Ancestry Library Edition; U.S. Federal Census, 1840-1860; Sarah Forrer to Samuel Forrer, 9-24 May 1862 [three letters], FPW, 4:2; Howard Affleck to Mary Affleck, 10 Apr. 1862, Howard G. Affleck Civil War Diary and Mary Affleck Letter Book (Mss. A64-275), Buffalo & Erie County Historical Society, Buffalo, New York. McKelvey, “Mrs. Harriet B. Patterson”; Martins Ferry Historical Society, “Edward Tullibardine Affleck,” accessed 21 July 2011, http://www.rootsweb.ancestry.com/~ohmfahs/cw-affleck.htm; American Civil War Soldiers (database), Ancestry Library Edition; U.S. Federal Census, 1850-1910. McKelvey, “Mrs. Harriet B. Patterson”; U.S. Federal Census, 1850-1930; Ohio Marriages, 1800-1958 (database), FamilySearch, accessed 12 Mar. 2012, http://www.familysearch.org; Ohio, County Marriages, 1790-1950 (database), FamilySearch, accessed 12 Mar. 2012, http://www.familysearch.org. This entry was posted in Biographical Sketches and tagged affleck family, archives, biographical sketches, bridgeport ohio, cholera, cholera epidemics, dayton ohio, forrer-peirce-wood, Harvey D. Little, howard family, little family, manuscripts, ms-018. Bookmark the permalink.